Justin's WeatherTalk: Radar Love- Or Not? 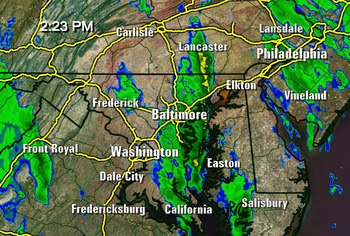 Recently I updated the radar image on the web site to show our new version and sample what will be on our new weather page at ABC2. I have had a few unhappy e-mails asking for the old radar to return. The radar itself is the same! Just the image has changed. While I insist that the old radar had graphics that were 10 years old, and the levels were too 'hot' or overdone- it's what many want. Here is an example from Saturday afternoon from about 2:21-2:23pm. There was a Severe Thunderstorm Warning in Harford County at the time. Map was designed in 1998. The yellow/orange shows heavier rain. The red most likely thunderstorms. It may give false indication of storms in the spring and summer. This has a different color table and our new maps. Here the yellow/orange is saved for very heavy rain or thunderstorms. You can see a comparison to the storm on the map above. Personally, while it might be easier to read the old radar, red on it gets used more often than it should. If we saw red on the new radar- it would mean business. Please make an honest opinion and answer the poll at the right. I will leave it up until Monday.